Just done the second BG podcast which is a load of new tunes, me going ‘errrr’ and, this time, no phones going off! Pro, or wot? 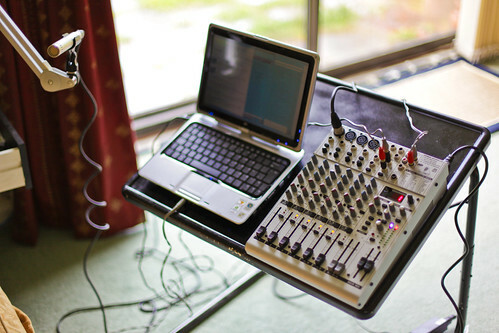 Ahhh… Today, I assembled the gear you see above and did my first ever Bzangy Groink podcast! It’s a truncated version of Wednesday night’s playlist (which’ll be up shortly!) where I concentrate on the new artists. Listening back, it’s obvious I’m a bit nervous and I do tend to say ‘ummmm’ a lot more than I’d like. But it’s not bad for a first effort!